Holidays over. I had a great time with my son on Mull and with my lovely wife on Arran . I managed to get some new stuff, and they can be found on the indexes. So it was back to our usual routine, heading East again. 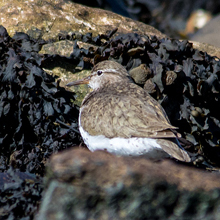 There was loads of Twitter traffic on the Spotted Sandpiper at Dunbar Golf Course and the Wryneck at White Sands. We had breakfast at Dalkeith Morrisons. Although the food was very good as usual we had to drop our rating to 8.5+ due to rather slow service and John getting a burst egg. At Dunbar Golf Club the sky was clear and the light was perfect for photography. 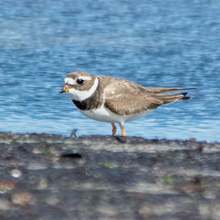 As we edged along the coastal path to the area where the Spotted Sandpiper was showing we came upon a fair number of fellow birders around a large tidal pool. 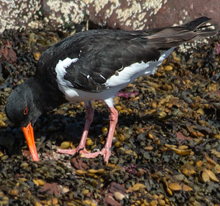 The bird was showing well but was tricky to spot as it was settled down among the rocks. However with some slight manoeuvring I managed to get some good shots. It hardly moved in the hour we were there so we decided to move on and try for the Wryneck that had been spotted just off the road at the Whitesands Quarry. There were a few spotters climbing the embankment as we arrived. We parked up and waited but all was fairly quiet so we decided to see if it had moved along the road to the beach. No Luck. 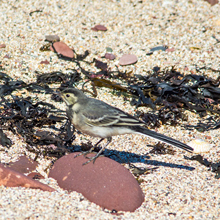 The beach was very busy but I managed a nice Oystercatcher and Juvenile Pied Wagtail on the way down to the water's edge. 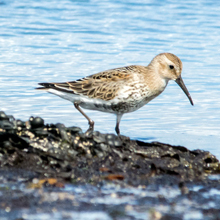 There was quite a large flock of Dunlin running the shore feeding and taking flight every so often. 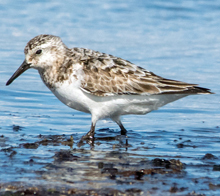 On closer inspection I spotted a Sanderling and a Ringed Plover amongst them. There was no sign though of the Curlew Sandpipers reported on Twitter so it was back to the car for tea and an apple lattice pastry, eyes peeled of course for the Wryneck. Again, no luck - but what a lovely day!